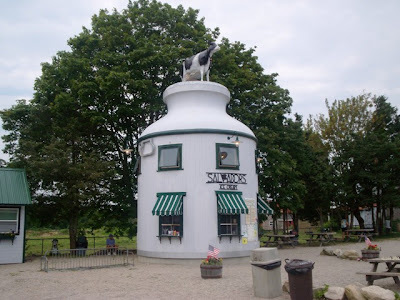 In an effort to eat at every weird-shaped ice cream stand in New England, Mom and I headed for Salvador's Ice Cream, a.k.a., the big milk can in South Dartmouth. We had never seen nor heard of Salvador's until a recent trip - or should I say mistake - while driving through historic Padanaram village. I took a wrong turn and BAM - we ran right into Salvador's. Our eyes lit up. 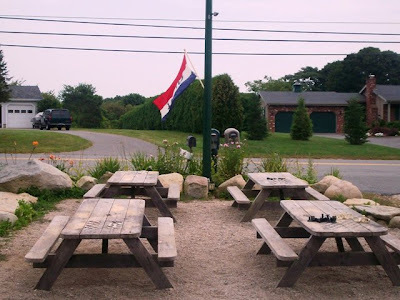 Mom and I just love restaurants that look like things (the creamer in North Smithfield, the coffee cup in Seekonk, the clam box in Ipswich, etc.). We vowed to return very soon to taste what they had to offer. Within two days, we found ourselves heading up to Dartmouth and pulling into Salvador's dirt parking lot at around 1:15 p.m.
Not bad for two good-sized smalls. The girl behind the counter was friendly and very quick in getting our ice creams. Mom and I took our cups to one of the four picnic tables that were situated in the center of the parking lot. Each of the four tables had painted-on chess boards and several pieces so that you could actually have a game of chess while enjoying the fresh air and ice cream. How adorable! If you want something more scenic, you could sit on one of the picnic tables behind the milk can and take in the view of a beautiful field. 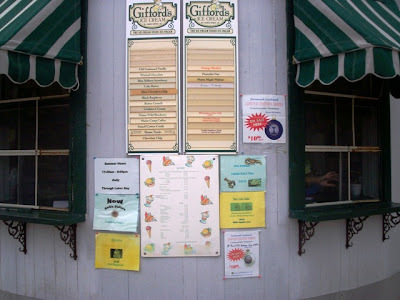 Also on the premises was a large walk-in freezer which stores all of the buckets of delicious Gifford's ice cream. Mom tried her ice cream first. It was just as she remembered - delicious. It was very creamy and chocolaty. She is still surprised at how much she liked this flavor. Just one spoonful a few months ago was enough for her to want to get her own cup. Mom said it is one of the best chocolate ice creams she has ever had. My strawberry cup was also fantastic. It was extremely smooth and surprisingly did not have any bits of strawberries inside (which sometimes turns people off to trying this particular flavor). I would definitely get this again. Also offered at Salvador's are the requisite shakes, frappes, cones, and sundaes. What I didn't realize until looking at the Web site was that they also offer food. Menu items include burgers, hot dogs, fries, onion rings, stuffed quahogs, chicken fingers, and tuna and chicken salad rolls. Although I didn't notice the prices for the food, all prices on the ice cream novelties were about average. I believe I even saw some Salvador's merchandise inside. What a good idea, considering they've been in business for over 70 years. We may have given ourselves away. Normally, Mom and I are quite sneaky with our picture taking and review writing. However, there was a gentleman that seemed to keep popping every time I had the camera aimed at something. It's like he knew what we were up to. Was it the owner? I'm not sure, but he did approach us at one point to ask if we were from out of town. Mom said, "Kind of. We're from Fall River." Yep, that is as out of town as we get. He was a very nice gentleman. Before leaving, Mom and I decided to get a couple of bottles of Poland Spring water ($1.25 each) which came in eco-friendly bottles. As we got into the car, we saw a young lady exit the stand and go into the large freezer to get a bucket of ice cream. According to the Web site, sample flavors are based on daily availability. Some flavors include frozen pudding, cookie dough, maple walnut, Maine black bear, butter crunch, and moose tracks. 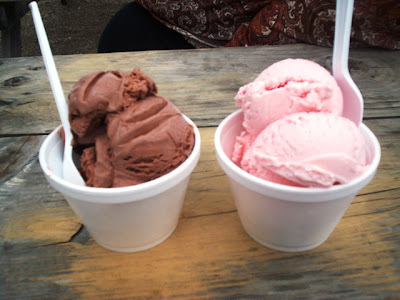 Mom and I enjoyed our visit to Salvador's Ice Cream. Sometimes it's good to get lost, and taking that wrong turn in Dartmouth really paid off. We got to visit another one of New England's great roadside attractions and have some delicious ice cream at the same time. What could be better? Salvador's Ice Cream summer hours are from 11:30 a.m. to 9 p.m. daily through Labor Day.